PLASTIKOIL® originated as an alternative binding option for one of Gateway Bookbinding Systems sister companies. In the 1960's, they were binding all of their publications at that time with comb binding. The company was looking for an alternative - something fresh, something new - in keeping with their progressive thinking. They came upon a very small, local manufacturer of this exciting, new continuous plastic spiral type of binding. Coil bound books could lay flat, could open a full 360 degrees, and looked great! Gateway made the change to plastic spiral and never looked back! Gateway Bookbinding, taking the basic coil forming equipment and the plastic formulas originally used, have evolved this exciting plastic binding product into PLASTIKOIL® - a now internationally recognized binding system that has become one of the most popular mechanical binding choices for today's books and printed projects. Gateway Bookbinding makes it their priority to offer the most comprehensive product and equipment line on the market, with the objective of enabling all potential levels of the industry to utilize the product with maximum productivity. As a two-time award winner of the Binding Industries Association Feingold Award for Innovative Excellence, our product and equipment designs and concepts have revolutionized the plastic spiral binding industry. 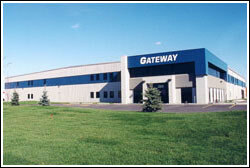 Gateway also enjoys the unique advantage of utilizing their own on-site trade bindery as a live test site for all product enhancements and equipment developments. Our Research and Development team continue to work on enhancing the coil, the manufacturing, and the coil insertion process. Gateway Bookbinding Systems specializes in plastic spiral binding. It's what we do – it's all that we do – 24 hours a day. We understand the product and we understand the process – better than anyone. We have been manufacturing plastic spiral binding products and equipment for almost half a century. As the world's most extensive coil manufacturer, our objective always has been and continues to be that of dedicated customer assistance and support – working with our customers to provide them with the most feasible, most economical solutions for all of their plastic spiral binding needs. Talk to our customers. Our reputation speaks for itself. One of trust - reliability - honesty and integrity. With a knowledge and understanding of plastic spiral like no other. Gateway Bookbinding Systems Ltd. The Plastic Spiral Experts.